Samsung has introduced a new tablet to the Galaxy Tab 3 range in the form of the Galaxy Tab 3 Lite (7”), but what makes this one any different? The latest model combines the best qualities seen in the rest of the Galaxy Tab 3 range in a slimmer, light-weight design that aims to maximise portability. Built around a 1.2GHz dual-core processor, the Galaxy Tab 3 Lite has a two megapixel rear-facing camera and includes features like Smile Shot and Shoot & Share. The former will automatically take a shot when it detects a smile while the latter allows images to be shared instantly. A 3,600mAh battery means the Tab 3 Lite isn't going to conk out on you midway through your favourite film and Sammy says the tablet will give you eight hours of video playback away from the mains. Samsung has also placed the navigation keys on the bezel, rather than add clutter to the 7-inch, 1,024 x 600 display. Over 30,000 applications are available through Samsung's own app store - many of which have been designed specifically for the Galaxy Tab 3 Lite. It's also fully Google-certified, giving access to the thousands of apps, music and movies downloadable through Google Play. Its fair to say that the Tab 3 Lite will have a tough time wrestling customers away from better-known portable tablets like the iPad mini with Retina Display, Amazon Kindle Fire HDX 7 or Google's own Nexus 7 tablet. However, the Tab 3 Lite does continue Samsung's seemingly neverending quest to product a tablet in every possible form factor known to humankind. And for that, we salute it. 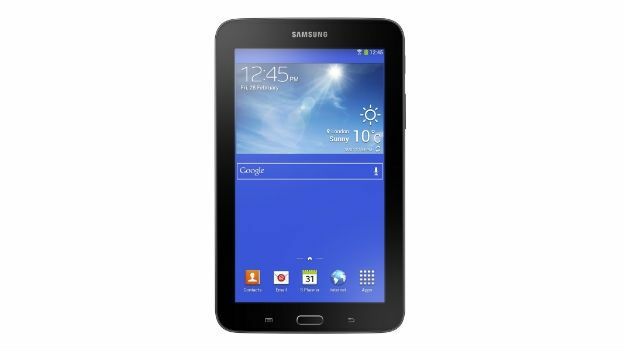 The Galaxy Tab 3 Lite (7”) is available in white and black. But unfortunately, availability within the UK has yet to be confirmed.